For the untrained person not familiar with the NLP jargon it may sound bizarre –internal representations sounds almost like “internal hallucinations”.Well folks, this may not be as far from the truth as you think. Technically, there are only six things you can do inside your head: see pictures, hear sounds, feel feelings, smell smells, taste tastes and talk to yourself. Five senses plus our internal self-talk. That’s all. What are you doing right now inside your head? Stop and check! That’s your internal representation. It has been estimated that we receive millions of bits of information from the environment every second through our five senses. 11 million bits of information every second!!!! I reproduce below a table of information form the same source which shows how much information is processed by each of the five senses. It appears that we’re missing out a tremendous amount of information. We’re left with just about 50 bits in our peak performance time out of 11 million…..
That leaves out just about 10 million nine hundred and nighty nine bits of information…..(10,999,950 to be precise). Do you realize how much we’re not aware of consciously? How much we’re missing out? Now, there is something we do even with those about 50 bits that we do process consciously. MihalyCsikszentmihalyiin the book “Flow: The Psychology of Optimal Experience”, Copyright © 1990 byMihalyCsikszentmihalyi, on page 29we find that we filter the millions of bits of information per second down to seven plus or minus two chunks of information (or about 126 bits of information per second). Hmmm.…Csikszentmihalyi is more generous than Britannica! However, even with the dissimilarity between 50 and 126, the amount left out is so enormous that the difference has little significance for our purposes here. But let’s say that he is right. We process consciously 126 bits which we group in 7 plus or minus 2 chunks of information. Now we know. We leave out a good deal of information of which we are not consciously aware. So what? 1.) What happens to the rest of information (from 11 million to 126)? Our bodies receive it – we just don’t process it! 2.) How do we even manage to find our way around with so little processed information compared to the enormous number of 11 million? To have a visual idea of how this works here is a diagram from our NLP Coaching Practitioner training. Notice that on the right hand side of the person’s head, thre is an arrow on which is written External Event. This is something that happens ouside of the body. As the information comes in via the five senses, in order to stay sane and not get in massive overload, first we filter it by deleting information, then distorting and generalizing other information. The we filter it again through other filters which are our personal experience of time, space, matter, energy, language, our memories, our personal decisions, values, beliefs, attitudes and meta-programs. For an explanation of what metaprograms are see our NLP Glossary. After all that filtering, what we’re left withis a – greatly reduced in size of the information – internal representation (IR) of the outside event. And you wonder why two stories of the same event never match? If you have a brother or a sister, ask them to tell you their version of a childhood event where both of you were present…. See if it matches yours. But don’t tell them what to say! Let them talk first. You will be surprised! So when you assume that everyone thinks like you about the same event…. We’re going to see in Part Two of this article why this is the case. That’s very interesting isn’t it when we’re thinking in terms of our memories NOT being the events themselves but simply an Internal Representation OF the events. So, with this thinking it tells me that – I cannot change an event unless I am in it’s time of occurrence because anything after the events themselves is going to be stored in memory as Internal Representations of the events. Therefore my memories are stored perceptions of some kind of a flow of life events to which I may change those perceptions but not the events themselves. So, if I wanted to change my past, well that just won’t happen because the events themselves have gone but, I can change my perception of my past, my Internal Representation and therefore how I feel about my past and it can then serve me best in future life events. It is very exciting when we find we’ve been able to change all this time, isn’t it? The biggest thing I take from this article is that one shouldn’t believe everything they think! As I have been preparing for the course, this wasn’t really anything new other than once again realizing the enormity of all the stuff that I am missing! I wonder whether we miss it because we just couldn’t manage to take more information in than we currently do. It made me also think of my experience yesterday which was that, after I had finished singing in a church service I became aware that I was glad that I hadn’t been operating machinery, ie I felt as though I had actually been asleep during the service, even though I thought I had been paying attention. I wonder how much our level of consciousness is related to our conscious or unconscious inner commands to pay attention or not. I wonder how much we can learn to control how much we absorb. This could open doors to many new options. May be if people paid attention to how they pay attention, then that may be just enough for some people to see and think differently. I wonder Liza if you were paying attention inside of you or outside of you and more over I wonder if you were paying attention to a Meme? What I took from this article is that because we mostly think of ourselves in terms of our past, if our past is really made up through our distortions etc then we don’t really have a ‘true’ picture of who we are which means possibilities can open up. This is good news! Totally agree Christian – people may not be who they think they are and moreover people can choose who or what they’d like to be. I think it is important to filter out the negatives and bring the positive outcomes to the surface. This can be difficult for some, particularly those suffering PTSD issues. What I take from this article is that it has confirmed, in more specific and understandable terms, what I have known all along. It is one of the main causes of our individuality due to numerous filters we have built up over our lifetime, filters which can be swayed by so many internal and external factors its no wonder we are all unique. Unfortunately I also believe this is one of the main causes of conflict in the world due to the inability to understand each other and I don’t just mean what makes sense but there is a deeper level of understanding that comes from experience. I’ve never really been able to grasp why it’s different but in a sense it is total clarity and if we can learn about the information above to achieve that level of understanding of people then I think this could be one of the paths that needs to be taken to make this world a better place. Interesting Scott – I believe the uniqueness of all individuals is the awareness behind the filters. What do you reckon? If we changed ourselves in light of the world we all might be in a better place but, here’s the thing – how unique can an individual be if the person is unconsciously influenced to be one of the sheep? I do believe that the other main cause of the uniqueness of all individuals is in the awareness behind the filters. My belief is these filters are part of what shape your awareness as I believe that what causes a person pain and pleasure can change. This leads me to believe that our true nature is forever evolving thus if we had the tools to help us communicate with each other in a more honest manner it would lead us to see a suitable outcome much sooner or at least know where we stand with each other. Peoples values also cause conflict which is another issue entirely. In terms of changing ourselves in light of the world possibly turning us into sheep, in a lot of ways I believe we already are sheep, so I think if people were given the tools to understand what everyone’s true motive is we would as individuals be much better equipped to take on the problems we each feel we need to deal with. Yup! Certainly people change – so it’s current version of self that’s really in constant change isn’t it? The later about true motive – well I think here we’re speaking in terms of separating a person behavior from their intention in order to see the person aren’t we? I believe that is accurate though the rate of that change is an important factor also. When I said true motive that in my internal representation it was to encompass separating a persons behavior from their intention along with a few other concepts that I am having trouble defining. It’s a good thing that we are also here to learn the linguistic tools to better portray our internal representation. I agree Scott learning the linguistic tools!!! A big Key! Spot on! Stay tuned for a new article about pain VS pleasure coming up in the blog. It is called B.F.Skinner meets C.G.Jung. RE Scott’s comment. I love the way you think. You said something so vitally important in your comment it is worth reposting here: ” It is one of the main causes of our individuality due to numerous filters we have built up over our lifetime, filters which can be swayed by so many internal and external factors its no wonder we are all unique.” This is the beauty of all of us – our unique individuality. The challenges we all experience in getting along with each other in relationships, business, and if you go more big picture between institutions, factions, countries etc., is what produces growth. If we were all the same there wouldn’t be any conflict is true, but then we would be biological androids – sort of artificial intelligences programmed to do a certain job for the duration of our life expectancy and …that’s it! Many of the differences you mention are not real and when I say real in this context I mean they are not part of our nature. They are installed in our minds from early life. Each generation has been mind-manipulated into the “trends” fashionable at that time. Compare the mind of the young people today with what they learn in school and the memes present when you were in school. And then it is more than just school, it is family, it is society in general, you name it. So what each of us can do is to begin to deconstruct all that system of beliefs we acquired and begin to figure out who we really are – not what we’re supposed to do; what we really believe not what we’re supposed to believe, etc. I hope this makes sense. I love that my Internal Representation of my neighbourhood is quiet. So I am unaware of my neighbour yelling on her phone in the back yard until a friend comes around and brings it to my awareness. Very cool Maree!! I love it! Currently, undertaking the NLP Practitioner in Melbourne with Brad and the experience that I have had to date and in particular to today clearly outlined for me on a personal level that where we think that we have dealt with trauma, violations and the like in the past, I realised only by going in trance state that my thinking behind my thinking, my unconscious mind had stored memories deep, deep down. well below the under belling that came up in the forefront today. The physiology out burst, the mind sense after wards and to continue with the lesson certainly was the hardest thing my brain had to do today. Thank you for this wonderful journey that I am part of and thank you for the wonderful team in Melbourne that also supported me with the thinking behind my thinking. As I look back on my journey through your post I realize that back then I was experiencing the beginning of a very special rapport with my unconscious mind. Don’t you feel closer to yourself Nikki? My takeaway is, in order to understand and to learn the tools to communicate in the true sense of NLP; to make a significant difference not only in our own lives, but those around us, we need to allow ourselves permission to know ourselves. Not to fear what we “think” our short comings are, or how we perceive that we have “failed” in the past nor how we feel that others measure us by. Taking the first steps to create a better life for the inside and outside of me can be a little daunting….. But incredibly fascinating and so rewarding already!….I’m looking forward to learning “The art of communication”. My journey starts on Tuesday…..bring it on! (smiling here). I would like to know, or understand and evaluate more. My key take away from the article is that we have absolute, unadulterated control of what our IR’s end up being. With great power comes great responsibility…. My key take away is that we have ultimate, unadulterated control over the IR’s we create. With great power comes great responsibility and limitless possibility. After reading this article, I feel it has helped me to really start to integrate the learnings of NLP in my mind. I have looked at that diagram so many times during my pre-study but only now does it all start to make sense. The more I learn, the more I realise that our brains are so complex and intelligent. The way we filter information and create experiences is a process that happens so unconsciously and now I realise that if we can tap into this process and access and delete certain information we can truly create the experiences that we want. It is funny I have always believed that every single thing that happens to us in our lives can be used to teach us something. We can either hold onto the event and believe it is a negative experience and say “why me” or we can use that experience to expand and grow. This philosophy has served me well to help me deal with and process experiences and learn and grow from them rather than holding onto negative emotions that limit me personally. 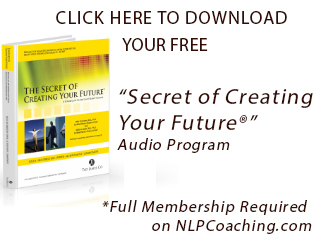 To think that I can use NLP to help me create amazing outcomes and help others in the same way is pretty exciting! I cannot wait to learn more and become more experienced in using all the techniques! I guess we are each a world onto ourselves and we are creators as much as we are created. To me, this article shows how we are our reality, and the way that we perceive our world is but the image of who we have become in response to our experiences. Our experiences shaped our individual mechanisms and selective processes, pathways, mechanisms and therefore our internal representations (IR). I guess we came here very clear and very ‘spherical’ , possibly ‘pure’, and ‘clear’, ’empty vessels’ – call it what you will…. That which knocked us around while we were ‘clear’ and unsuspecting in a sense shaped those mechanisms and IR very early on. That base formed our individual house of cards in which we find shelter at this time. Both that which we absorb and that which we utter represent the shape that we have become. The biggest think I take from this article is that perception is reality and no one same perception can be achieved. Therefore, we have a number of different realities. There is no one blanket or definitive reality. It is also important not to assume or expect another person to have the same thinking as you. We all see things in a different light. Through understanding this, relationships and experiences will become more positive. You will arrive at a higher level of consciousness and be able to accept people and situatuions for what they are rather than wanting them to be as you see or as you want. This then eliminates expectations and our stories that we attach to thoughts to become reality. It is best we understand differences and that our view is not necessarily the same view of another. I think this is an empowering knowledge to know in that we can cease expectation and demand and just be at peace with what is. For me this reinforces the idea that the map is not the territory. Basically each and everyone of us is going around with our idea of the world and depending on how we deleted, distort and generalize, we may actually be close or far for actually reality. I read recently that we are all the product of our experiences but if these experiences are not serving us now, then our inner reality could well be like a cage with our method of delete, distort and generalize the bars. 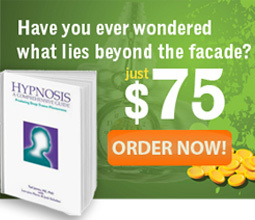 I Had Just Completed The Hypnosis/Time Line Therapy And NLP Course. NLP Techniques I Have Removed Completely All Of My Anger And Guilt From My Past.I Feel Lighter In Myself And I Can Now Concentration More. I Wish To Thank All Those People Who Have Been Involved In The Hypnosis/Time Line Therapy And NLP Course At MANTRA ON RUSSEL In Melbourne From The 17 Nov To 23 Nov 2015. Brad Greentree Has Done An Excellent Job In Transfering My Life For The Better. I like this because it explains why my sister and I have such different takes on childhood memories! My understanding is that our attention resources are drawn to the most familiar, novel and salient information that we perceive around us. I guess there exist opportunity then to reframe what is familiar, novel and salient. …and yet: the scientific boffins are finding more and more evidence that a large degree of how we emote/feel subjectively in response to a stimulus can be predicted by objective parameters. Eg the “golden mean ratio” in facial attractiveness, human ears respond preferentially to the pentatonic scale, the pleasantness of an odour is highly related to the compactness of its molecular structure….Makes me wonder if it’s all this clever consciousness that’s getting us into trouble in the first place. That’s a very interesting read, One thing I’ve taken from this is we can do a great deal of re-working with the information we have and also if one, changes their filters the information being allowed or processed will be different and will bring about a whole new reality. What I take from this is, how we remember something happening is completely different to how it precisely happened, which is also true for anyone else who was also a part of that experience. I noticed that objectives or goals are not part of the model, but I’m speculating that we subconsciously take from the experience what we believe is relevant to help us achieve our objectives. My biggest take away from this is that, every ones take on a experience may be different even when the inputs are the same. It seems to me that after we have processed, distorted, filtered, interpreted, and stored a memory of a event, whenever we re-visit that memory, we actually re-visit that interpretation. In doing so, we reinforce the emotion surrounding it, then we react to the emotion. If we could instead, recall the clear factual detail of the event itself (since Tad says we do have perfect recall), we’d have much greater flexibility and resourcefulness to process the event in hindsight. Wouldn’t that be great?! It’s really good to understand what influences our consciousness to take in 7 +/- 2 chunks of information per second. Our filters are our personal experience of time, space, matter, energy, language, our memories, our personal decisions, values, beliefs, attitudes and meta-programs. It makes sense. I smiled at the memory (IR) of seeing on a fellow co-workers desk earlier today the Mihaly Csikszentmihalyi book “Flow: The Psychology of Optimal Experience”. I was so attracted to pick up the book that I saw it on his desk, passed him to my own desk, and then returned to read the blurb. And that was before I received Brad’s email with the instruction to read this article. I’m not surprised by the coincidence, however, because if the NLP preparation studies have taught me anything thus far, my subconscious ‘remembered’ I had seen the book before and had made a mental note to read it one day because it would be relevant for my research and work. My main takeaway though had nothing to do with Csikszentmihalyi. I wanted to know how the researchers came up with number of 50 bits of information versus Csikszentmihalyi’s 126. One example the Encyclopaedia of Brittanica gives is based on reading rate. “A typical reading rate of 300 words per minute works out to about 5 words per second. Assuming an average of 5 characters per word and roughly 2 bits per character yields the aforementioned rate of 50 bits per second.” This was really interesting to me because it’s doesn’t seem to be 100% known. I can see how it’s possible to get 126 as well. This begs me to question, what does the latest research indicate? Does anyone know? My biggest take away from this article is how we all perceive the same situations differently. I’ve always wondered since I was a little girl, is “Red” really “Red”? Is the “Red” that I see the same as the “Red” you see? Now knowing that we each delete, distort and generalise all of the information that comes in, put our own spin on it and end up with our very own IR- My question is now answered! Very interesting Brad! I can’t believe how much we are bombarded with every single second. I feel as though those 11 million bits are overwhelming me preparing for this training :). You know I think I’ll only take 50 so I don’t feel so bombarded! On a more serious note a recent situation came up within my family when we were moving house with a major downsize taking place. I decided to give each of my four children their childhood gifts for their own keeping. One daughter said, ‘that’s mine’ and another corrected and said ‘no it belongs to me’. That sure generated a lot of conversation and self reflection around how each of us recalls something a bit different. Wow 11 million bits of information per second, no wonder my brain deletes, distorts and generalises mostly all of it! This article really helps me to appreciate the power of our conscious and subconscious mind. Now I know why my husband and often can’t see eye to eye on the same things ;o). Perception truly creates the reality you experience! Thanks brad. Thanks Brad for the heads up for the next time my wife Angela tells me about her day.I will simply remind her that It’s impossible for me to process everything she tells me at once. After reading that article…It’s no wonder miscommunication is the key area where relationship breakdowns can occur. Filters, filters and more filters. It takes me back to a conversation with my sister a few years ago about a traumatic family situation. Admittedly we were both very young at the time and the differences in our stories were very profound! Everything we experiences in our reality is only our perception of the actual event. And this perception has been filter unconsciously. It proves to me that our mind is really and truly our most powerful tool and if used correctly we will be able to achieve the impossible. If we can truly trust our subconscious and pay attention to it, we really can make the improvement we want. One of the things I have taken from this is that as stated, we “consciously”process 126 bits/7 + or – 2 chunks of information per second. The rest is “received by the body but not processed consciously processed”, so is the rest absorbed subconsciously? I love how detailed the description is, in regards to how we process information. I really describes clearly how each person can end up with different views of the same event. With all the information coming to us, it’s important to ensure we are as closely aligned with our goals and purpose as possible. That way we can utilise as much as possible. And even though ewe cannot see it, the information in the environment will still influence the whole of us. My takeaway from the article is that we are the creators of our own IR – it’s our perception of reality rather than reality itself. Reminds me of the ‘who’s driving the bus?’ question. 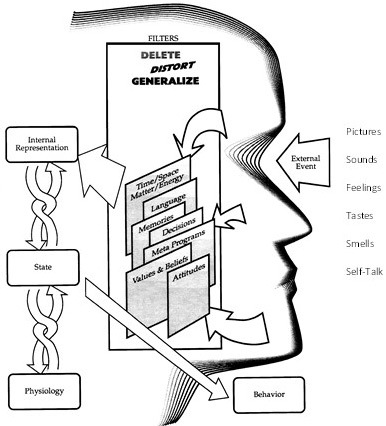 Two people have an experience however how they filter the information (delete, distort, generalise) can be vastly different based on their meta-programs, beliefs, values, attitudes, etc so their reactions to the same situation and their subsequent behaviours are based on their internal representations. This is a powerful concept for working to change behaviours. My creative take, is of a huge archive that needs to be decluttered. Not because my perception will ever be (or need to be)like someone else’s but because it will free up space for a better map of my inner world and ultimately of those interacting with it externally. As a whole we can achieve a better world one person at a time. Understanding how I have deleted, distorted & generalised without this knowledge has impacted my life, and created stagnation, but the willingness to declutter and heal has shown a better map and eagerness to stay in the “good” cause and effect side of the equation. The unconscious mind is a friend not a boss and only asks for clear directives to serve, the first step to attain this is to create rapport with it, not to be forgotten that it has an important manual of the body and how to keep it in perfect health and our perceptions of health impact this important manual, it’s like making unsound corrections on something utterly perfect. It’s Ok to have an archive for all the memories its the interaction that we have with the archive that is important. Each experience is a film and the actors have their own view of the scenes, however it can be improved, we either create a film of war or one of peace. Each in their own way with NLP can learn a new “language” to communicate even if their recollection of an event is not like ours. Looking or feeling the parts that make us hurt/worry etc… to understand where to look or how to feel for a better perception of the other and ourselves and ultimately respect the perception of the other and not try to fix it. Its all about perception. As to the remainder of the 11milion bits of info that are left out after we chunk it, are we really sure it is lost or isn’t that it’s all there but we just don’t consciously know it? Love what NLP is showing me but mostly of the “how” it can be changed. Interesting; I think I know who I am and what has made me the person I am today (including all the things I am proud of all the way to limitations I feel or things I think need to change) but reading the article just highlights that I wasn’t focussing and in the meantime my subconscious mind has happily been making IR’s on my behalf (some I might agree with and others I might not). I haven’t been paying attention (or learnt how to pay attention). I guess the knowledge that NLP techniques can help clarify and deal with limiting emotions and assist with unrealistic distortions (filters applied etc) provides some light in the tunnel ;). I find it amazing that our minds are able to a) select and filter millions of pieces of information; b) ‘instantly’ determine what the most relevant pieces of information should be and c) essentially manipulate information in a way that we can make sense of it within our world. All while we aren’t even consciously aware of it! Looking forward to delving deeper at the NLP Prac and Master Prac! Is there any definition of ”bit of information”? What I take from this article Is that every individual has his unique way of accepting information and then processing it according to his understanding. That what he understands, is stored in his brain and the rest in his subconscious. How he processes it is his internal representation. It is always interesting about how the mind works. I always knew of the 7 plus or minus 2 which really is a thing. I, like most others, fall into the trap of forgetting that other peoples perceptions are different to our own and this is due to exactly what was described above. By trying to remember this, it keeps me in check about not passing judgements and being more aware in the diversity of thought among everyone. What I personally take from the article is that we will develop a conscious awareness about an event that is entirely based on the way we unconciously process information based on our Internal Representation. My biggest take away is that no-one can be right or wrong – it is purely perception and no-one holds the ‘whole picture’. The ability to stand back and understand everyone’s internal representation allows a deeper understanding of the event and yourself. What a wonderful machine our nervous system and brain is!! This has really opened my eyes to the idea that there is no one reality and every single persons interpretation of the world can be so completely different from another persons. This knowledge has allowed me to let go of so much anger and resentment towards other people when it comes to disagreeing on certain topics and allowing everyone to have their own opinion. I am less defensive and much more accepting with this knowledge. I was brought up to believe in one reality and there is right or wrong for everybody (which was my parents version of what was right and wrong). BUT actually there is only what is right or wrong for you, based on YOUR past experiences and how that filters your perception and the information YOU personally process as being true. “We’re left with just about 50 bits in our peak performance time out of 11 million”. 11 million bits of information per second is a crazy statistic! Wow! Understanding that these bits of information are filtered by us based on our beliefs, values, past experiences makes so much more sense as to why I think differently to a certain situation than someone else. Fascinating article Brad! Thank you for sharing it with me. What I take away from this is understanding how it is that we take different versions of our he same ev it. Filtering information about trauma and experiences which continue to find answers through the training looking for to the week of training. It’s amazing to learn here that filtering is normal and natural thing we do, and seems necesessary to stay sane. And also that how a person sees the world, their representation, has has to do with their internal filters. Fascinating stuff. The article made me realise that I also am ‘aware’ of some of the information that I consciously filter eg like anything to do with numbers, or has numbers in it. I have a childhood belief that I will struggle with numbers – so I don’t even bother noting them. The sentence “There are only six things we can do inside our heads” stood out for me. It feels like so much more! Reading the article highlights for me how complex communication with others can be. I will definitely try and be more flexible, patient and understanding of different viewpoints now. Working within the Aged Care industry in the realm of Dementia practice, I see people struggling even with the 5 to 9 pieces of information left, and also sometimes the lack of filters. From this, I have a whole new appreciation of listening behind peoples words and watching what they are saying with their bodies and actions, whilst also being aware of my own experiences in life and how they may distort the actual events that are happening in the now or have happened in the past from another persons point of view. This really comes to the front when people in the last stages of their lives are dealing with “unfinished business”in the process of moving on to the “heavenly arena”. My thoughts about events create things in my mind from my history, but also, they may affect the way I see things in the future, I am acutely aware of this and make efforts to see everything in a non-judgemental way, from imagining stepping into others shoes if I can. I’m so excited to be attending very soon. Interesting article. A good explanation why people see events differently and, maintain different memories. What stands out for me is that to understand each other communication skills are very, very important! What I take away from this article, is that there is a lot of information that is filtered away, and for each person what is filtered through and what is being deleted is different for each person, so if 2 people experience the same event it will always be experienced in 2 different ways. The 2 different ways might have similarities, but there is always 2 different stories coming out in the end. I have often in the past wondered how 2 people can experience the same event in 2 different ways, but the more I have worked with people I have found that it is important to listen to both sides of the story to get the bigger picture. that our unconscious mind is a filing cabinet of information ready to come to our conscious mind just need to learn how to better use bourse brain. What I take away from this is we are all our own experiences Good or Bad we delete,distort,generalised we have just a small filtering system with which we do this.We are a part of parts that can be rearranged in a Positive way to make a whole, and NLP is the building block to make this happen by bringing us to a kinder more positive understanding of ourselves and others. What I took away when I first heard this is that I will never be able to receive every single signal but my unconscious mind can. By meditating I am able to access some more of it and I am able to surrender it so i can feel into it even more. So instead of my initial response to not perfecting it I just surrender into the knowingness that I am on the journey I am meant to be on and signals that I am meant to pick up will be picked up for my greater good and if its not picked up then thats my imperfect journey too and thats perfect. I have certainly gained more awareness of my own filters and triggers and can work on them. In doing so I have a heightened awareness of other peoples triggerst/states and can when intentionally be aware of an upcoming “situation”. Imagine what massive changes I would work make in this world when I start with me. With these tools, Bob’s your uncle…its an Aussie one…google it 😉 haha. Don’t always believe what you see or hear etc. It’s easy to miss the bigger picture. What I take away from this article is that we are bombarded with information constantly and our conscious and unconscious minds play different parts in filtering and recording this information. This also means each persons perception will differ, depending on how their internal representational system is formed. – If this article has been available for many years why has no-one corrected it? and I was also happy that I picked up the errors because I have an editor for all my writing as spelling and grammar are not one of my strengths. So If my comment has errors in it, it is because it was not checked by my aunty (my editor). People have been commenting on this since 2015. And no one has mentioned the errors. I am surprised. Then the other take away is we really are very selective with what we process. And hopefully this means we have the capacity to take in more with increased awareness. The information I take in is influenced by the state I am in and the possible outcome I am looking for or need to understand at the time. My take away is that by being aware of this unconscious process we can make it more conscious and influence what information we look for in our external experiences (eg. signs of rejection or opportunities to connect with others.) . Amazing how much we unconsciously miss and what our brain makes up for us. I find the idea that we delete and distort and generalise really interesting in relation to the context of what criteria it bases its decision on. My question is that in by changing our internal make up – values, beliefs etc can we really change the way our mind distorts, deletes and generalises? What are we missing and how can that impact our lives. Looking forward to finding out!